These several examples demonstrate how iOS apps can be used for live performance and studio recording together with other instruments and audio devices. Usually for live performance very convenient use the MIDI controller for control the audio processing apps or simple MIDI keyboard for synthesizer apps. For the best audio preferable to use an external audio interface connected to the iOS device. With MIDI controller and audio interface you can conveniently use apps for live performance even on iPhone. 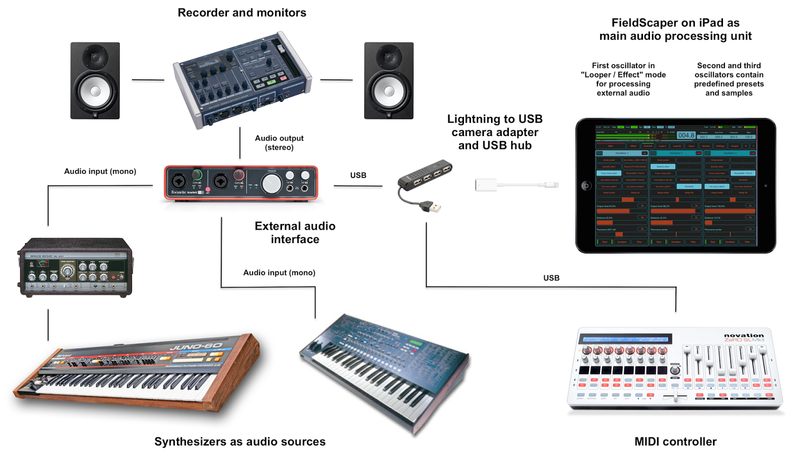 To connect several USB MIDI and audio devices to single iPad or iPhone you can use simple non-powered USB hub. Mostly any hub works without problems. But in this case you should use power adapters for your MIDI controllers and audio interfaces. Or you can use powered hub and connect to him any controller that can powering thru USB. In this setup were used two apps SynthScaper and FieldScaper on iPads, three DIY sound boxes and analog synthesizer with two analog effect units. 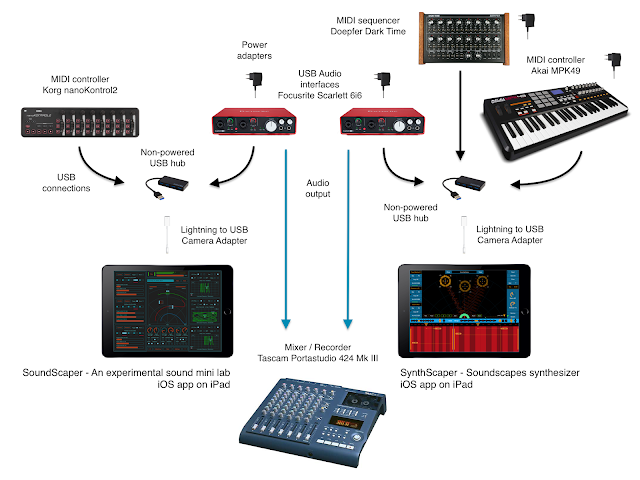 The SynthScaper app was controlled by a MIDI keyboard/controller Akai MPK49, and FieldScaper app by MIDI controller Novation Zero MKII. 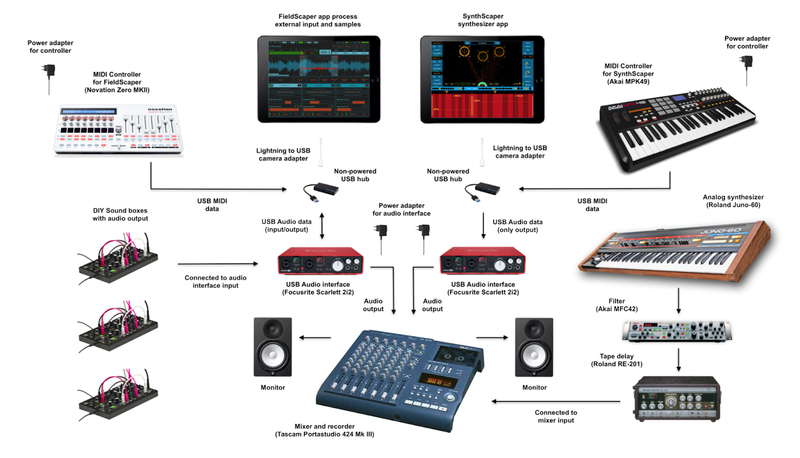 Each iPad with own app was connected to individual audio interface Focusrite Scarlett 6i6. Stereo outputs from these interfaces were mixing and recording on Tascam Portastudio 424 Mk III. Of course it could be any other mixer and recorder. Also to the mixer was connected separate mono audio output from synthesizer Roland Juno-60 processed thru filter Akai MFC42 and tape delay Roland RE-201 Space echo. Outputs from DIY sound boxes were connected to external audio interface of FieldScaper app. The FieldScaper processed sound from these devices in real time with the first oscillator in the "Loop" mode, and also plays and processed several pre-recorded loops in the second and third oscillators. 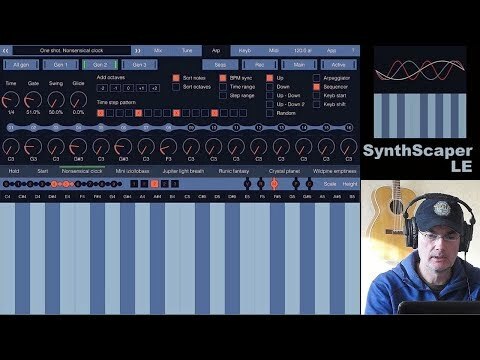 There is another setup with SynthScaper and SoundScaper apps. In this example different oscillators in SynthScaper control by external MIDI sequencer Doepfer Dark Time and MIDI keyboard/controller Akai MPK49. The SoundScaper app was operated by MIDI controller Korg nanoKontrol2. Two stereo outputs from external audio interfaces Focusrite Scarlett 6i6 were mixed and recorded on Tascam Portastudio 424 Mk III. All USB devices (except Korg nanoKontrol2) have own power supplies and connected to iPads thru non-powered USB hubs. Korg nanoKontrol2 powering from iPad battery thru USB hub. Two synthesizers processed by FieldScaper app. In this example two synthesizers - Roland Juno-60 with additional effect unit Roland RE-201 Space echo and Korg MS2000 were used as external audio sources for first oscillator in FieldScaper app. This oscillator was configured in "Looper" - "Effect" mode. Synthesizers were connected to two different input channels of external audio interface Focusrite Scarlett 6i6. In the app these channels mixed to one for use in oscillator. For this oscillator was used the slightly modified preset "Dark and foreboding places". Two other oscillators in FieldScaper app were configured for using pre-recorded samples with several presets. All oscillators were operated by using MIDI controller Novation Zero MKII. The six faders at the right side are assigned on "Main effect" and "Output level" for each oscillator. Buttons below assigned for switch between presets and samples. Knobs at the left side are assigned for mixer "Distance" / "Panorama", filter "Frequency" / "Resonance" and for "Clock" / "Clock offset". Stereo output from FieldScaper app thru external audio interface was recorded on Roland V-Studio 100. Live improvisation with iPad apps SynthScaper and FieldScaper (using factory presets). And also with three magic boxes as sound sources for FieldScaper app and Roland Juno-60 with Akai MFC42 and Space Echo RE-201. Recorded on Tascam Portastudio 424 mk III. Without post-processing. SynthScaper is a synthesizer specially designed for creating and experiments with ambient soundscapes in wide range from noises to melodic instruments and everything in between. FieldScaper is advanced field recorder combined with a sound warp engine and a collection of ready to use dynamic presets for iPad and iPhone. Discover new ways to create and construct unusual and exciting sounds from any environmental audio recordings or samples recorded from other apps through Inter-App audio or Audiobus.